After two decades of discussions and votes to allow the construction of an 11,000 square foot conference center and 150-room lodge in Grover Beach, two recent appeals have stalled the project. In April, the California Coastal Commission unanimously approved a plan to construct the project near the entrance to the Ocean Dunes. Two members of the California Coastal Commission members then appealed the project. Members Steve Kinsey and Mary Shallenberger said they are opposed to the project because it does not prohibit a seawall from being built in the future. In addition, San Francisco attorney Thomas Roth filed an appeal on behalf of Friends of Oceano Dunes over San Luis Obispo Superior Court Judge Charles Crandall’s ruling that the APCD has the authority to regulate off-road vehicle activity on the Oceano Dunes. 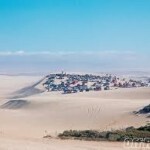 Friends of Oceano Dunes argued that the APCD used flawed scientific practices and failed to prove that off-road vehicle activity on the dunes has caused an increase in pollution on the Nipomo Mesa. The dust rule requires the California Department of Parks to reduce the amount of particulate matter blowing from the Oceano Dunes to Nipomo Mesa or face fines of $1,000 a day. Friends of the Dunes, though not opposed to the project, has also voiced concerns that the relocation of a RV dump station will impact access to the dunes. The project, currently expected to cost in the $30 million range, is slated to boost the economy in the struggling beach community through increased tax revenue and income from tourism. Another (does sand end with a T) storm. I really don’t understand why anyone would try to build anything around here. I was up on the top of Longview Ave in Pismo a while back and I noticed a sign in someone’s yard that said “Save Price Canyon”, so I mentioned to him it’s funny that if the other side of the canyon had built first, they would be trying to keep you from building your house. Boy, he exploded at me! I was wrong, he’s only against it because of the little animals that live there. Yeah, right. People move to our area because they like the balance of natural areas, housing, and businesses to serve the people who live here. It doesn’t matter when someone moved here. Unless you were part of the original native migration eons before, you’ve moved here after somebody else lived here. The behemoth convention center the gluttonous developers and their toady local real estate hacks want to bill is not suitable for a unique environment such as the Oceano dunes. It would forever change the natural beauty and space. Real estate hacks seem to think that just because there is an open space, it MUST be developed, no matter the impact on the local community. It is THEIR argument that is wrong. Those who don’t want development have it right. “Developers and their ilk”? “Degrade the natural areas”? Do you live in a Teepee? Are you one with nature? I get a little tired of the holier than thou attitude of many San Luis Obispo residents. Face it, you’ve got yours, so now screw anybody else who wants to build on their private property. Especially if it blocks part of your view. I laugh when MM and others refers to the “behemoth convention center.” Hello? The convention center is smaller that a typical Trader Joe’s! The hotel and conference center project is 121,370 sq. ft. (and is 40 ft. tall). Thanks. I stand corrected. This article and others refer to it as an “11,000 square foot conference center,” which is smaller than the typical Trader Joe’s. 121,000 sf is big. It’s about 85% of the size of the Costco in SLO. You can always tell when someone is being hypocritical because they get touchy and angry and use phrases like “Care to make something of it”, or exaggerate with words like “Behemoth” or “Gluttonous”. Just sayin’. So what your sayin is “I got mine” and your screwed. Pretty hypocritical isnt that Mary? Far as a convention center in Grover? shite….how long will pay back be on a $35,000,000 project? At what point will it create enough revenue to pay for itself let alone fix the roads to hell compliments a crack pot city manager. The people will need all those dune users to stick around with their jacked up 4×4 valley trucks to haul folks in and out of Grover because of the roads. At one time is was “selling the community garden is going to fix Grover Beach”, then it was the convention center will fix us, and with it delayed, wonder what the next big fix will be, other than the new fire tax they are trying to push through. In the meantime Grover Beach’s road crumble, businesses close or too difficult to start, and yet public salaries and benefits increase. Wonder if they will ever get a clue, first start reducing costs,(salaries and benefits) and quit hiring new personal, but of course the threat will be services will be cut, and yet private sector is able to cut costs and keep services. I am curious about the basis for some of your statements. The one about public salaries and benefits increasing would apply to SLO (city and county) and some of the other larger cities but I was unaware that was a big problem in Grover. While there is always room for improvement, I have seen no obvious major waste in GB except for the ill-planned aesthetic “improvements” on Grand Ave. I had always heard that the biggest problem with the lousy streets and sidewalks was due to a lack of funding. That is a predictable consequence of a Conservative/Libertarian attitude about keeping government small. Lower taxation levels mean less services. It may be a tradeoff worth doing but don’t complain about it if you don’t get the best of both worlds. In my experience, Grover has been relatively friendly to business compared to other coastal communities (although there is a little room for improvement there too.) I really don’t know what your complaints are based upon in the case of this particular town.